Ramen is something I rarely order in KL because the broth is often lackluster or full of MSG. 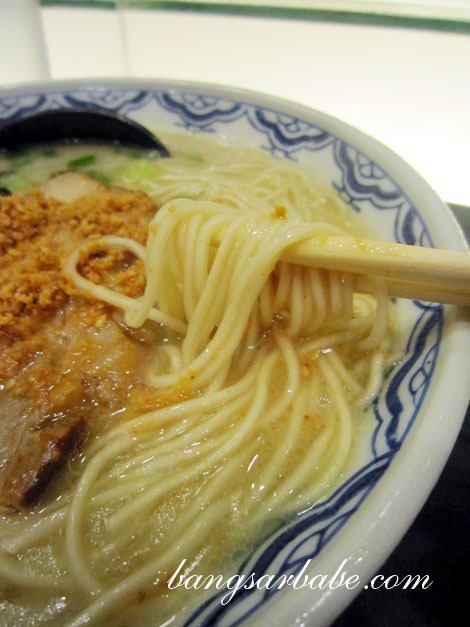 But I went ramen crazy in Singapore – trying 8 types of ramen throughout my 10-day stay. 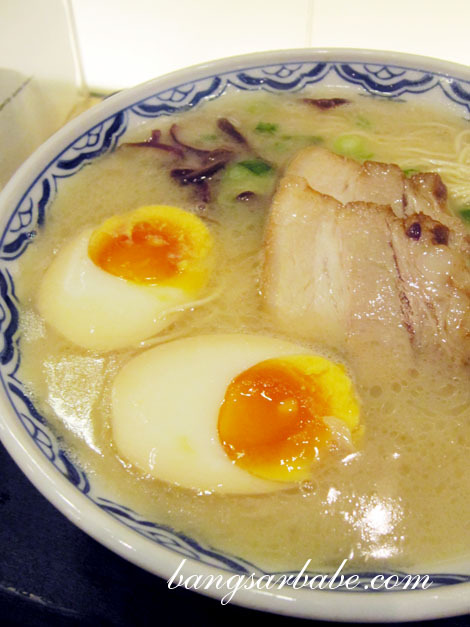 Yoshimaru Ramen Bar in Holland Village is famous for its Hakata Ramen, also known as Tonkotsu (pork bone) Ramen. The pork bones are boiled for more than 13 hours, resulting in a cream coloured stock with a glittering layer of oil on the surface. That alone is reason enough for a revisit. 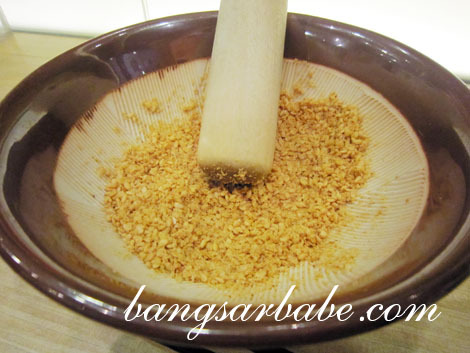 I was given a bowl of sesame seeds to grind while waiting for my noodles; it gave the ramen a fragrant nutty aroma. I took a few seconds to admire the noodles, breathing in the ramen perfume. The Tonkotsu Ramen was a delicious mash-up of textures and flavours – crunchy cloud ear mushroom, sharp spring onions and meltingly tender pork slices in a tangle of springy noodles. I don’t think I’ve tasted a broth this porky and thick, and enjoyed the heady deliciousness right down to the last drop. 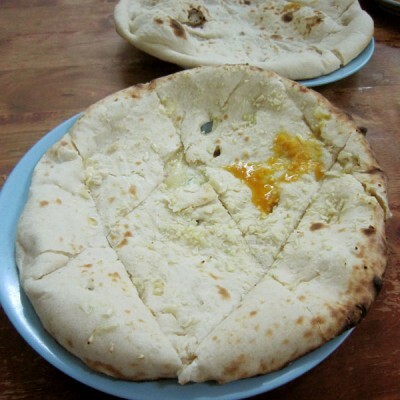 I liked how the egg was cooked just right – gorgeously runny at the centre. The noodles had a slight alkaline taste but I didn’t mind it so much as the broth was very tasty. My set (SGD16.90) came with a drink, salad and a choice of side dish. 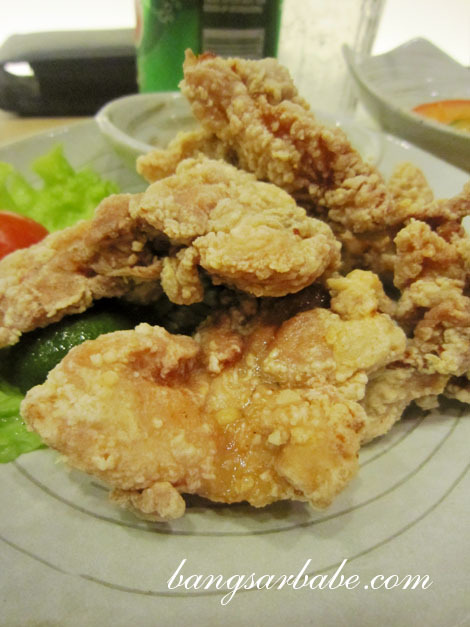 I had the Japanese fried chicken – nothing special but crisply fried and oh-so-moreish. 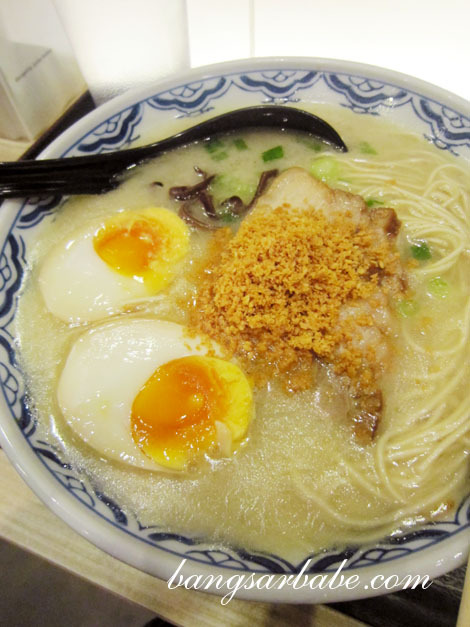 If you’re less greedy, you can order just the Tonkotsu Ramen for SGD11.00. rif’s Karamiso (Spicy Miso) Tonkotsu Ramen was also very tasty. This broth just as creamy and murky, but the spicy miso helped offset its richness. I liked this, but appreciated the enthralling murkiness of my Tonkotsu Ramen more. 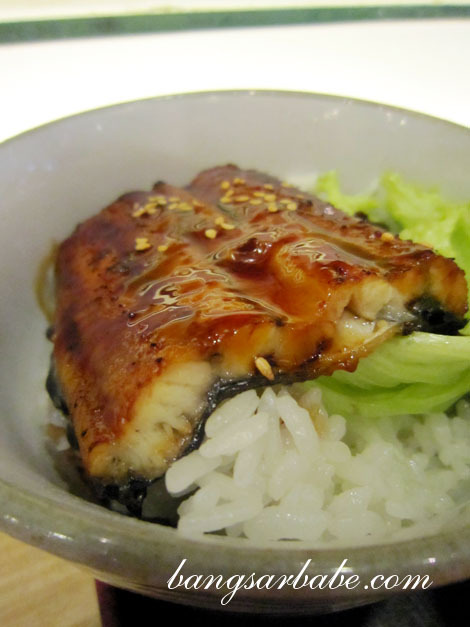 His Ramen & Rice Bowl Set (SGD18.90) came with a choice of salmon, unagi or char siu for the rice bowl. He chose unagi. We were both very full from the ramen – portions in Singapore are larger – and could barely eat the rice. In the end, we ate the unagi and left most of the rice behind. This was nothing great so unless you’re really hungry, stick to the ramen. Yoshimaru was packed that night, so we sat by the bar counter. I didn’t mind as I got to watch the chefs prepare my ramen. This got me started on my ramen craze in Singapore. Will be blogging about my other ramen finds soon. 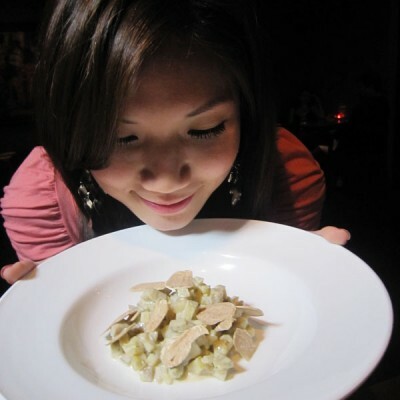 Verdict: Deeply porky and murky broth…in a good way! It’s really yummy. Very fragrant! Ooh, a little bit of interactive dining with ‘grind it yourself’. Nice right? Work for your meal. Hahaha! 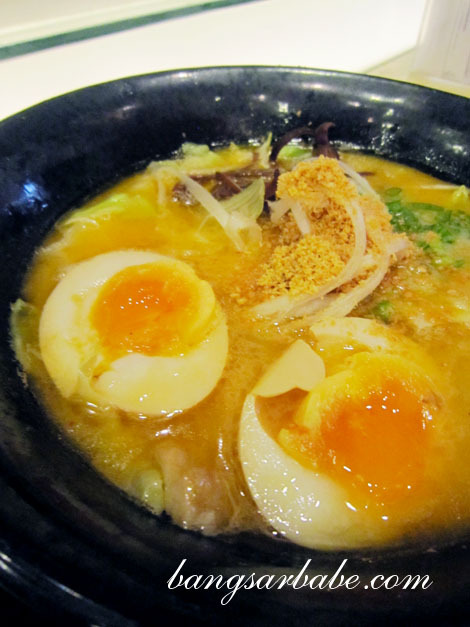 Have u tried Hokkaido Santouka Ramen? Is it decent when compared to the SG ramen? Not yet. Am planning to try it this weekend just to see. Marutama was no where close to this.